Bamboo is becoming a very popular commodity in the kitchen. Not only do bamboo countertops provide a beautiful and natural alternative to synthetic materials but they also are a renewable resource. Many concerns revolving around bamboo countertops are spawned by the idea that it may not be a safe preparation area for food. The bamboo is laminated with a food grade adhesive to ensure it is a safe surface for edibles. Bamboo is a diverse material that contributes to the ‘green’ trend in today’s society. One of the more attractive features of the bamboo countertops is that they are renewable. In today’s society, this is not only an environmentally friendly achievement but also is also a practice that is highly encouraged. Bamboo countertops are renewable in the sense that they can be sanded and refinished as required restoring to a ‘just installed’ look. However, this is not the only feature that sets bamboo apart from conventional countertops. Bamboo is recorded have a harder surface than that of maple by at least 16%. While bamboo was once reserved for cutting boards and floors, today the bamboo countertop trend is on the rise and consistently rising with the ‘go green’ attitude today. Depending on the company that manufactures bamboo countertops, the thickness of the countertop can vary according to individual manufacturers and distributors. Typically, they are sold in 1.2 – 2 inch thicknesses. Styles and color also vary by independent manufacturer or distributors. Generally, the bamboo countertops are available in natural grain patterns with variable lightness/darkness. The edges of the bamboo are intricately designed in some instances or with a simple edge. Both fancy edging as well as simple attractive edging are a welcome member to any kitchen family. Wood in general is a popular choice for kitchen countertops because they are extraordinarily attractive and show off the natural grains of wood. For some reason most people are strongly drawn to the natural look, which is why, many fabricated items have faux design of wood or stone. The downfall to the real deal with bamboo countertops and others made of wood is that they are prone to burning, scratching and water damage as wood is a naturally porous surface. There is also very few options to choose from when working with a natural material such as bamboo. Wood countertops take some care and work in order to maintain the look and feel of the original piece. However, on the upside of the bamboo countertops they can be repaired repeatedly to restore the newly installed appearance. There is another huge advantage to installing bamboo countertops and that is the warm and welcoming feel permeates throughout the kitchen. Bamboo creates a smooth work surface that is easily cleaned with household cleaners. It is not believed to be as sanitary for food as natural stone because it is porous and allows some moisture to be absorbed. It is this reason that dictates following a strict cleaning regime to avoid unwanted bacteria growth. Bacteria growth can lead to cross contamination of foods that have been exposed to the surface and cause such things as salmonella poisoning. Bamboo has definitely moved up on the scale of renewable resources for interior design. It is not only for walking on bamboo flooring anymore, it has climbed the ladder rungs and jumped onto the kitchen workspace. Remember that although no one countertop material is waterproof, stain resistant, heat proof and durable; bamboo countertops give conventional countertops a run for their money. Bamboo has also become incredibly affordable and will not break the bank in order to achieve that soft, warm feel of the new kitchen. 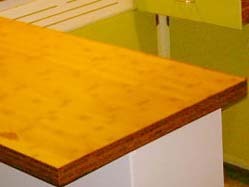 Bamboo countertops are generally priced between 25 and 30 dollars per square foot making this one of the most attractive, affordable wood countertops available. Discover what bamboo can bring to your kitchen today!